Peace Road Designs are made in Dahab, South Sinai. Finding good quality souvenirs is not easy in Egypt. Peace Road tote bags made from vibrant Egyptian tent fabrics are a perfect and practical reminder of Egypt for yourself, or a beautiful gift to take back to friends and family. Each style shows real consideration of what you need in a great bag, and every bag is very well made, with strong stitching and wide, secure straps. The quality of the bags reflect Peace Road designer Bronwyn Jones’ training in tailoring, and her refined eye for colors and patterns. Designs include a two-way tote which is the perfect size for the beach, a baby diaper bag, and a yoga mat carry bag, and the range is growing. The inside of the one-way tote bag has color coded pockets including two large open pockets for easy access to your phone, camera, or notebook, and a zip pocket for cash and passport. There is a loop to keep your keys safe. The sides are finished square, so you can even fit a water bottle in the bag without stressing the seams. I have turned my bag inside out and it is so well finished that it looks just as good with the pockets on the outside. Peace Road is environmentally friendly and has another range of bags made from post-consumer recycled clothing, which means they are one-of-a-kind. Bronwyn has also developed an environmentally-conscious initiative and eco-friendly way to use old denim jeans. She collects pre-loved jeans that would have gone to waste or ended up in landfills, and customizes them using various colored fabrics. Jeans, jackets, shirts, shoes and even suits can all receive the Peace Road creative treatment. She also offers customers the option of having their own pieces customized. The colourful designs are inspired by the patchwork tents of the nomadic Bedouin of South Sinai. Peace Road extends its ethical concerns to the community, by working with Bedouin women from South Sinai. These skilled women hand-make a variety of products including beaded accessories. Purchasing directly from these women is a simple way to empower the women of Sinai and increase their quality of life, not through charity but by giving them a career, self confidence and independence. Bedouin girls make bracelets of thread in vibrant colors, and a bracelet is used to attach the swing tag to each Peace Road bag. Bronwyn is also teaching two young Bedouin to sew, and hopes to see them produce their own designs eventually. See more at https://www.facebook.com/PeaceRoadDahab and Like the page to stay informed of new designs. Nuweiba is the perfect place to relax and re-balance, and Nuweiba Yoga Studio provides for your well-being in many ways. The studio is in an elegant and peaceful home.The main yoga room can comfortably hold 10 people, has windows looking out to sea and good natural light. It is equipped with mats, blocks and belts, and wall ropes, is air-conditioned, and there is a sound system for music if needed. The other yoga spaces include a large flat roof area which looks across the mountains and the sea, and this is also a beautiful place to spend the evenings watching the stars in the clear Sinai skies. The Studio has its own beach, with a gazebo where you can mediate or relax lulled by the sounds of the waves. Teacher Susan Metwali will lead small, intimate classes or work with you individually. Susan is a qualified Yoga teacher and has been teaching for over 20 years, mainly in West and South West London. She welcomes both beginners and those more experienced in Yoga asana practice to her classes. Her teacher training began with many years of Iyengar Yoga classes including classes with BKS Iyengar and Geeta Iyengar. Susan has also chosen to expand her knowledge with other teachers and has developed a style of teaching that embraces the knowledge of these great yogis. Drawing on her experience of working with many different age groups and abilities, Susan’s style of teaching focuses on the individual and allows a sense of joy and personal ease to be experienced through the practice of the eight limbs of Yoga. Yoga classes take place at the studio almost every day, with a Morning Session: 10.30am – 12 midday and Evening Session: 4.00pm – 5.30pm. Meditation and breathwork are also offered, and Susan can provide Reiki treatments, head massage, women’s body massage, Ayvrvedic facials. The studio is also available for hire by yoga teachers and teachers of other disciplines such as pilates, dance, tai-chi. This can be by the hour or a teacher can arrange to bring a group of students and teach them at the studio for a week long retreat. The Studio will arrange accommodation, meals and airport transfers as an all in one attractive package for the teacher who can then charge his/her students on an individual basis. If you are looking for a retreat for yourself or a small group, Nuweiba is a peaceful contrast to bustling Dahab or crowded Sharm el Sheikh. We suggest that anyone visiting Egypt schedules a class during their time in Nuweiba, and encourage locals to become regulars at the Studio. If you live and work in Dahab or Sharm, a day or two in Nuweiba will refresh your love of this area and a session at the Yoga Studio will refresh you. As Egypt seeks to find its path into the future, the annual CARAVAN Festival of the Arts has the theme “In Peace and with Compassion …The Way Forward”. Hosted at St. John’s Church in Maadi, sponsored by the Embassy of Switzerland in Egypt, and supported by the British Council, the festival will be held from 9-16 May and will focus on visual public art, literature, film and music. The CARAVAN Festival of the Arts was founded five years ago with the objective of building bridges of understanding, respect and friendship between East and West, and between Muslims and Christians, through the Arts. The week-long festival attracts thousands of visitors from around Egypt and the world. One of its unique aspects is that, to date, the festival has taken place at the historic St. John’s Church in Maadi/Cairo, a center for interfaith dialogue for over 80 years. The heart of this 2013 CARAVAN festival is a visual public art exhibition. This year over 45 premier Egyptian and Western visual artists, Muslim and Christian, are participating in what will be a truly unique public art-oriented exhibition for Cairo. The 2013 CARAVAN visual art emphasis seeks to follow in the footsteps of an approach to public art that has featured painted animals. 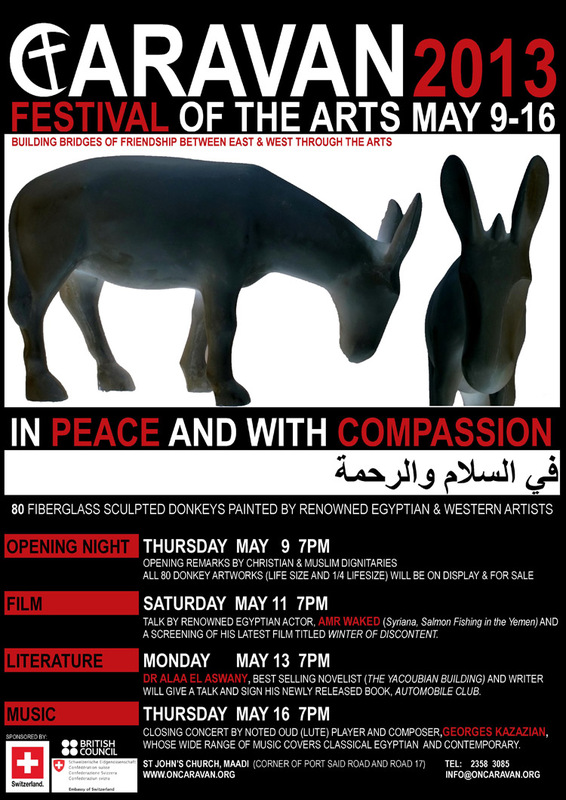 The subject in Cairo will be the donkey which symbolizes peace in both Islam and Christianity. Participating artists included celebrated Egyptian artists such Reda Abdel Rahman, George Bahgory, Ibrahim El Dessouky, and Mohamed Abla, to expatriate artists such as the well-known Norwegian artist, Britt Boutros-Ghali. Additionally, there are special participating guests in the festival for film, literature and music include noted Egyptian actor Amr Waked, who will be giving a talk and a screening of his latest film, Winter of Discontent, Dr Alaa El Aswany, the best selling novelist of The Yacoubian Building, who will give a talk and sign his newly released book, The Automobile Club, and the renowned oud (lute) composer and player, Georges Kazazian. All attendance is free of charge, and 20% of all art sales go to Egyptian charities assisting the poor regardless of creed. The third Dahab Bedouin Festival was held 21-27 April, and gave the community and visitors to Dahab many insights to Bedouin life, from way of living and law, to herbal remedies from St Katherine. Dahab visitors were treated to a magnificent full moon over the Red Sea this week, and many people found quiet places between the cafes to sit and enjoy the evening. Winds were also good, with kitesurfers and windsurfers enjoying the beginning of summer. Some more photos from the semi-submarine trip featured in the previous post https://naturetravelegypt.wordpress.com/2013/04/12/semi-submarine-ras-katy-reef-red-sea-sharm-el-sheikh/. Glass bottom boats are another way to see the underwater world of the Red Sea. If you don’t swim, snorkel, freedive or scuba dive, how do you get to enjoy the miraculous underwater world of Egypt’s Red Sea? A trip on a semi-submarine. Submarines are not permitted in the Red Sea, so this is a semi-sub. The deck stays above water, the hull has large windows for you to watch from, and you can move from one side of the sub to the other as more interesting marine life presents on each side. This is a much more immersed experience than a glass-bottom boat. Banks of corals, schools of fish, and the simple pleasure of sunlight filtering through the water, were accompanied by exclamations in Italian, Russian, German, English and a few other languages from the tourists around us. A guide drew our attention to different species of fish and coral as they passed us, or we passed them. Enjoy this video http://www.youtube.com/watch?v=RgEZjaOZzsk and the slideshow above, and multiply the beauty by 5, then you will get some idea of the experience. This video and photos were taken on a basic camera and could not fully capture the colors or the perspective of what you actually see when you look directly through the windows. You can photograph and video your own experience, or you can just sit and take it all in. Nature Travel can arrange your semi-sub experience http://naturetravelegypt.com/ and show you much more of Egypt. Luxor and Aswan have one of the highest concentrations of ancient Egyptian monuments and antiquities, and the journey along the Nile by boat or train will reward you with sights that will amaze and stay in your memory always.